My husband loves carrot cake, so what better thing to bake him for his birthday cake? As aforementioned, we are going to be cupcaked out by the end of next week, so I thought it would be better to make his cake a bit different from the endless sponge that is to come go for something he’ll enjoy. I hope. This is a new recipe for me and involves a triple layering. Not for the faint-hearted! Or for the poor in skill (that’ll be me then…). The cake-making bit was fine apart from the endless grating of carrot which I managed without serrating any of my digits (but through luck more than anything else). I always use a kitchenaid to make cake, so unless instructed otherwise, assume all beating is done with the help of a mixer and not by hand. I beat 3 eggs, 300g of soft light brown sugar and 300ml of sunflower oil until well-mixed then added 300g plain flour, 1 tsp bicarb of soda, 1 tsp of baking powder, 1 tsp ground cinnamon, 1/2 tsp ground ginger, 1/2 tsp of salt and 1/4 tsp vanilla extract and mixed well. Then I added 300g of (laboriously) grated carrot and 100g of chopped walnuts. This bit I’d do by hand else you’ll end up with smush. 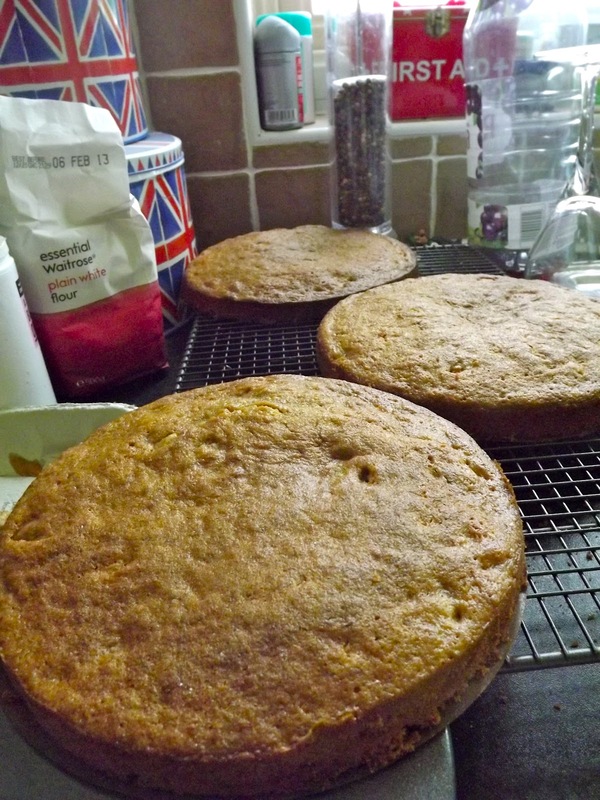 I divided the mixture into 3 x 20cm cake tins and baked for 20 mins at 170ºC. To make the icing I sifted 600g of icing sugar and mixed it with 100g soft unsalted butter (using the paddle attachment). Then I added 250g of cream cheese and mixed on a medium speed for 5 mins. As you will see from the photos, icing is not my forte. Especially a triple layered cake. The only other attempt I made at one of these was exactly the same, a big splotty cakey version of The Leaning Tower of Pisa! Possibly I should level off my my cakes before I ice them, but that would mean a lot of nifty and straight knife work. Anyway, I ploughed onward iced each layer with 1/4 of the icing then used the last quarter for the sides. I ended up with a somewhat wonky, but nevertheless iced cake adorned with walnuts and shortly afterwards a plastic golfer and three birthday candles. The result was a good. Not excellent, not poor but good. The icing was creamy and delicious but rather over powered the cake. Perhaps next time I will try two thicker layers rather than three thin ones. The cake was SO moist – fantastic! The taste was fine, but for me I would perhaps increase the cinnamon and ginger to one teaspoon for a bit more ‘kick’. As predicted, the kids hated the cake and only liked the icing. No change there! But Husband and I enjoyed it and he is taking the leftovers into work tomorrow for further devouring.